Bronchial asthma, a common respiratory disorder affects 10 million people in the Australia. It is a chronic inflammatory disorder of airways, which leads to shortness of breath, chest congestion, coughing and wheezing. Tamaka Swasa is a term used in ayurveda for bronchial asthma. However, it is caused by vitiation all three humors, but Vata and kapha are predominant in bronchial asthma. According to ayurveda, the common causes are excessive use of lablab beans, raw milk, black grams, sour curd, excess salt and aquatic animal food. Dry and heavy diet may also a cause of bronchial asthma. Other factors are excess cold, cold bath, excess sunbath, excessive exercise, etc. Ayurvedic texts have mentioned numerous effective natural remedies to cure bronchial asthma in children and adults. Ayurvedic treatment of bronchial asthma involves the use of ayurvedic medicines, organic herbs and dietary & lifestyle changes. There are certain herbs, which are very beneficial in management of bronchial asthma. These herbs are discussed below. You can get these herbs in veggie capsule from “Pure Herbal Ayurved Clinic” in Melbourne, Australia. You should consult an ayurvedic doctor for more details about the use of herbs in your symptoms. Inula racemosa or Puskarmool is helpful in pleurisy, treat chronic cold, and cough. It is known for its anti-tubercular properties. It is a febrifuge, an aromatic tonic and an expectorant with several carminative, anti-inflammatory, antiseptic and diuretic properties. This herb is also helpful in relieving pain in chest. According to a research done by Pooja Khurana et al, Pushkarmool is a very useful herb in the treatment of asthma. It has anti-histaminic and bronchodilator action. The main alkaloid in the oil derived from the root of this plant is alantolactone, that has anti-inflammatory and anti-bacterial properties. Pushkarmool has ushna, virya and vatakaphahara properties which is the main dosha in bronchial asthma. Pippali or long pepper is a powerful rejuvenative herb. It acts as a stimulant for respiratory and digestive systems and has rejuvenating effects on lungs. The roots of this herb can be used to treat respiratory infections. Consumption of this powdered herb along with honey can provide relief from cough and cold. One pill of this herb made from the fruits of long pepper and calotropis giganta in same proportions can be given twice a day until this disease is under control. Herbal decoction prepared using licorice can be consumed if you sense an asthma attack. Half teaspoon of ghee or few drops of mahanarayan oil along with one teaspoon full of licorice root (yasti madhu) is used to prepare this decoction. It helps in eliminating kapha from stomach and clears phlegm in bronchial tubes and lungs. However, you should not use this herb, if you are having hypertension. Findings of a research done by Ladde Shivakumar and Shalam enlist the uses of Licorice (Glycyrrhiza glabraradix) in treating asthma. The herb’s active compounds, glycyrrhetinic acid and carbenoxolone, are potent inhibitors of cortisol metabolism, thereby enhancing endogenous and exogenous steroid benefits. Several experiments done on sensitised rats also point towards the benefits of licorice for asthma treatment. Ginger acts as a natural expectorant. It is used since ancient times to treat several respiratory infections and helps control bronchial asthma attacks. Freshly grated ginger, along with little turmeric can be added in milk while boiling. You can have it twice every day. As per the research done by Ranjita Prasad et al, the dried rhizome of ginger contains approximately 1–4% volatile oils. It is considered to be a powerful natural anti-allergy agent specially acting on respiratory system. It has powerful expectorant properties that are very helpful in asthma. This is a wonderful spice, which can help control bronchial asthma. It helps clear kapha from stomach and clear phlegm from lungs. Half spoon of cinnamon powder and a little honey can be consumed twice a day to get rid of phlegm. Prolonged use of this herb can help relieve bronchial asthma. It provides relief from blocked phlegm. 2gms of nagar powder and bharangi (Clerodendrum indicum) can be mixed in water to make a fine paste and can be taken along with lukewarm water to treat bronchial asthma. Roots of ashwagandha have several medicinal properties. It acts as an adaptogen and helps reduce stress. It is known as a rasayana (rejuvenating) herb. This herb plays an effective role in treating bronchial asthma. Turmeric has medicinal properties, which can help treat respiratory disorders. Anti- purulent as well as anti-inflammatory properties in turmeric help treat cough, cold and other respiratory infections. It plays an adjuvant role in clearing air blockage due to bronchial asthma. Turmeric can be used in several ways to treat bronchial asthma. You can add little turmeric in your milk and drink it daily. Inhaling the vapors of hot water and turmeric can help clear nose blockage. It is yet another spice which helps treat cough and cold. Add a pinch of black pepper, turmeric and ginger in milk and boil it for few minutes. You can drink it twice a day to get rid of phlegm in lungs as well as from cold and cough. It is also known as blue fountain brush. This herb helps balance vata and kapha disorders. Bharangi has anti-histamine properties and helps treat bronchial asthma in an effective way by stabilizing mast cells. Few grams of nagar along with bharangi when mixed with water can be consumed in lukewarm water. Garlic is being used for ages to cure several diseases. You can add freshly grated ginger along with few garlic cloves in the milk you drink. This is an incredible ayurvedic treatment to treat asthma. In addition to ayurvedic treatment, yoga can also help in bronchial asthma for improving lung capacity. Breathing exercises can promote optimum health of lungs and strengthen respiratory system. Yoga posture beneficial in asthma are Nadi Shodhan pranayama (Alternate nostril breathing technique), Kapal Bhati pranayama (Skull shining breathing technique), Ardha Matsyendrasana (Sitting half spinal twist), Pavanamuktasana (Wind relieving pose), Setu Bandhasana (Bridge pose), Bhujangasana (Cobra pose), Adho Mukha Svanasana (Downward-facing dog pose), Badhakonasana (Butterfly pose), Poorvottanasana (Upward plank pose) and Shavasana (Corpse pose). 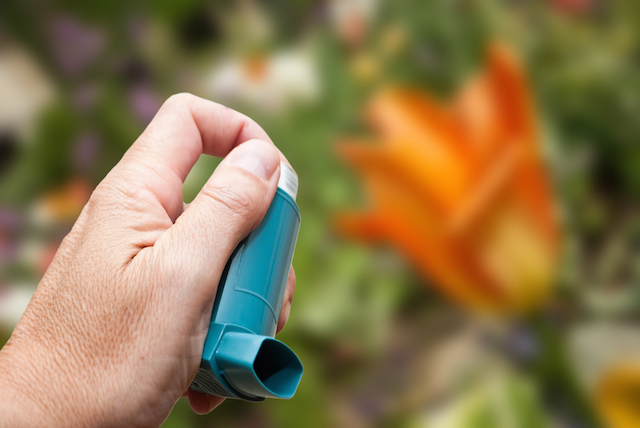 Most of the people only rely on medications to get relief from the symptoms of bronchial asthma. You can also make few changes in your lifestyle to maintain your health by lessening the possibilities of asthma attack. Using an air conditioner can reduce exposure towards pollen. Air conditioning can also reduce indoor humidity and exposure towards dust mites. Cover nose and mouth, when exposed to colder air. Exercise regularly. However, consulting a trainer or physician is recommended to know which kind of exercise suits the best. Maintain healthy weight. Overweight or Obesity can increase the severity of asthma symptoms. Eat healthy foods. Eat fresh fruits and vegetables, which are abundant in antioxidants. GORD is a disease that can cause heartburn and damage airway passage due to acid reflux. Consult doctor, if frequent heartburn symptoms persist. Modern medicine alone cannot cure bronchial asthma completely but in combination with Ayurvedic products it can be cured from root, prevented and controlled. People suffering from bronchial asthma should consult Dr. Gurnam Saini today in Melbourne, Australia to know more about the ayurvedic treatments of bronchial asthma as well as herbs and its effects on the health.